I recently reviewed the dividend safety and business prospects for consumer goods giant Procter and Gamble. Let’s stay in the same sector today and take a close look at Kimberly Clark stock. We know Kimberly Clark is operating in a tough business climate against stiff completion. Is the dividend safe? What do their business prospects look like? Specifically, let’s run them through a dividend deep dive to see what’s going on with the Kimberly Clark stock dividend. Kimberly Clark is organized into three operating segments based on product groupings. It’s hard to get through the day without touching one of their products or a similar product marketed by their competitors. So let’s first review what Kimberly Clark develops, manufactures and sells to us as a consumer. Included in this segment are solutions and products such as disposable diapers, training and youth pants, swim pants, baby wipes, feminine and incontinence care items. Products in the consumer tissue segment mainly include facial and bathroom tissue, paper towels and napkins. Let’s call it what it is. Specifically, kleenex, toilet paper and napkins. Nothing fancy here, but the type of stuff we all use every day. This segment partners with businesses. They put Kimberly Clark products into the work place. Products like wipers, tissue, towels, apparel, soaps and sanitizers. You may have seen Kimberly Clark towel and soap dispensers in your work place bathrooms. Finally, the Kimberly Clark stock symbol is “KMB”. And KMB stock trades on the New York Stock Exchange. Kimberly Clark stock pays an annual forward dividend of $4.12 per share. Based on the recent KMB stock price, that dividend payout puts the Kimberly Clark dividend yield at 3.6%. That’s a nice dividend yield from my perspective. I normally target stocks to purchase with yields ranging from 3-5%. That’s the sweet spot for me as long as I’m comfortable with the dividend growth rate and dividend safety. Dividend growth rates have slowed across the consumer goods sector in recent years. And Kimberly Clark is no exception. The low to mid-single digit percent increases are similar to what both P&G and Clorox have been delivering. Furthermore, the trend hasn’t changed in 2019 for the Kimberly Clark stock dividend. Management announced a skimpy 3% increase early in the year. On the brighter side, the recent dividend increase represents the 47th consecutive annual increase in the Kimberly Clark dividend. That’s a long streak and I do not expect it to be broken any time soon. In fact, I expect KMB to be a dividend King in a few years. Dividend Kings have increased their dividend each year for 50 straight years! So let’s take a look at the business fundamentals and dividend metrics next. Kimberly Clark will turn 150 years old in 2022. They have devised a business strategy around this anniversary date called K-C Strategy 2022. Underlying this strategy is the assumption that growth in the categories they operate in will remain modest and similar to recent conditions. There is nothing spectacular here. We are not going to get filthy rich investing in this company. However, it is nice to see dividend growth mentioned prominently in the strategic plan. 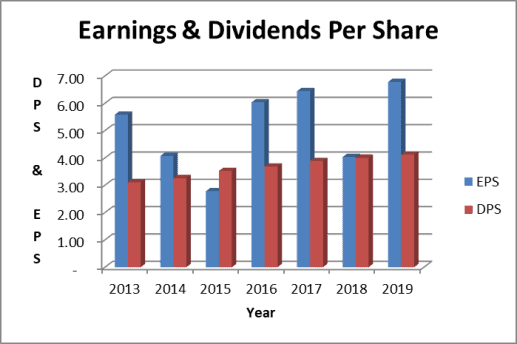 Reading between the lines, the strategy calls for 4-6% dividend growth annually. 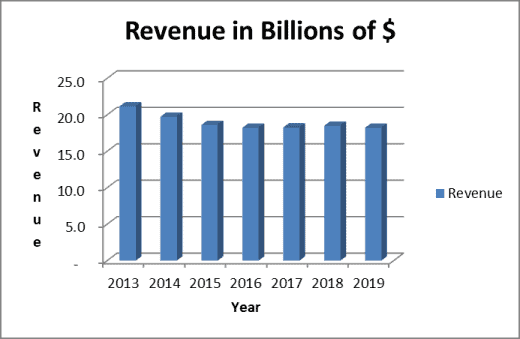 Revenue growth has been nonexistent over the past few years. On an absolute basis, it has bounced around just above $18 billion since 2015. Branded consumer products businesses have been facing major headwinds. Organic growth rates have been weak as consumers shift to lower cost private label products. Furthermore, 50% of revenue is generated outside the US. There is stiff competition from local brands in these foreign markets. There doesn’t seem to be much relief in sight. Management expects slightly negative revenue growth in their projections for the coming year. Recent accounting earnings have been a little choppy. 2018 included a large one time charge for a global restructuring program. Absent that charge, 2018 earnings would have been similar to 2017. It is good to see the company restructuring and taking costs out of their system. This will better align with the realities of their global market place and the potential negative effects of commodity price inflation. 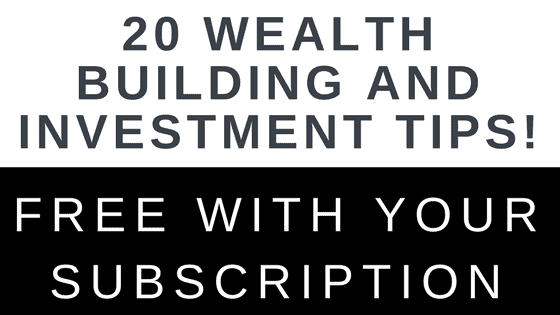 With the restructuring charge out of the way and savings from this program kicking in during 2019, projected earnings look more than sufficient to cover the dividend. When accounting earnings are clouded with one-time adjustments, I like to check the dividend against free cash flow. Whether you look at the dividend payout against accounting earnings or free cash flow, it looks safe. The payout ratio is around 60% in either case. Kimberly Clark has an A2 and A credit rating from Moody’s and S&P, respectively. These ratings represent “investment grade-low credit risk”. This is an adequate sign of financial stability and the company’s ability to pay its obligations as they come due. The company employs a significant amount of financial leverage. They finance nearly 100% of assets with debt and other liabilities. Contributing to the financial leverage is the company’s use of cash and equity to retire outstanding stock from the market each year. This is also known as stock buy backs. Stock buy backs are great to see. But I actually would prefer if some of this cash allocated to repurchasing shares was allocated to dividend growth. However, I do not see any change in capital allocation practices in this regard based on Kimberly Clark’s 2022 strategic plan. Finally, the use of financial leverage is not a concern for me as it relates to Kimberly Clark stock. They have stable demand for their products. And a long history of consistent earnings and cash flow generation. Apparently Moody’s and S&P see it in a similar light to assign an investment grade rating. Lastly, Kimberly Clark’s stock valuation looks pretty reasonable. It trades at 16 times projected 2019 earnings. It is about right in my opinion for a stable dividend paying company experiencing slow growth. Kimberly Clark stock holds a small position in my dividend stock portfolio. Nothing particularly excites me about the company prospects. 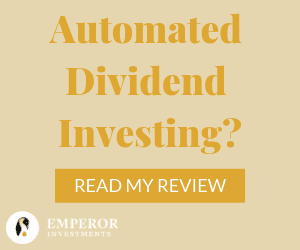 However, it is a steady dividend growth stock and there is nothing wrong with that. annual dividend growth. It’s not a get rich quick investment, but I am okay sticking with slow and steady to win my money race. I currently own Kimberly Clark stock. I was listening to an audiobook that mentioned how we as consumers unknowingly converse in terms of brands rather than product types – e.g. 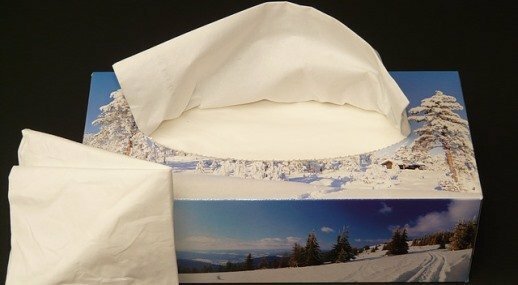 Kleenex VS Tissue Paper. And as Warren Buffett, this is a great MOAT. The dividend is pretty nice. Though I am one of those consumers that uses store brands almost exclusively now. I do see KC products all around in commercial settings. Poise and Depends- those are huge brands especially for elderly. I would think as baby boomers start to need these incontinence products more and more then their revenue will also increase. Hey Tom, amazing they’ve been around as long as they have, and 47 years of dividend increase is nothing to be ‘sneezed’ at – but doesn’t the slowing or declining revenue concern you? 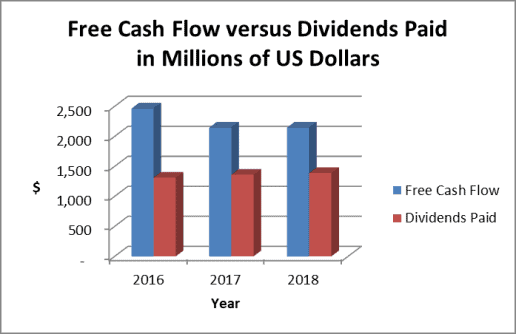 That free cash flow looks like it is slipping more and more each year, and unless they find a way to return to revenue growth (which looks very challenging), it’s hard to see how they can keep increasing that dividend at a meaningful rate? KMB is one of the holdings that I’ve been wanting to add to but the price just hasn’t hit my target while I have funds available. I’m looking for an entry around $105, so a touch higher than your target. I view them as one of the “steady eddy” holdings that won’t knock your socks off with growth, but will be a consistent performer. Nice analysis Tom! I have added KMB to my portfolio and never regretted that decision. I think the dividend paying out safe and agree with you that KMB will likely remain a dividend king for years to come. Plus, I can’t argue with their dividend yield either. Not as high as others (such as AT&T), but not the lowest either. Hi Tom, at the places where I worked at, we used their sensor-triggered paper towel machine, and that is a great product. That’s probably only thing I could relate to Kimberly Clark. From your post, I realized they are much closer to our daily lives than I originally thought. Kudos and phenomenal analysis. Clean and easy to read. I agree with your assessment and conclusion. As usual, my input is out of left field. Unless normalized, the five year numbers may be impacted by the Halyard (now Avanos) spinoff. The more recent numbers are due in large part to commodity pricing which has increased 20-60% due in large part to trade tensions and tariffs. Both KMB and PG are rolling in price increases which may send more consumers toward private label. That said, I’m still adding on dips as 6% of my portfolio is allocated to KMB and I’m a little below 5%. Good review! Like you point out, it’s a slow and steady one. There are three companies that anchor my portfolio at a max 6% – KMB, CLX and WEC none of which are barnburners. My guess is until the tariff game ends KMB will lag due to pulp cost uncertainties.